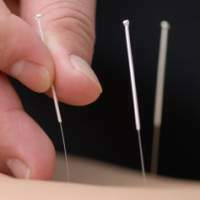 Acupuncture involves inserting fine single-use sterilised needles into specific points on the body, or applying various other techniques to the acupuncture points to bring about healing. Scientific trials around the world have found that acupuncture is a safe and useful treatment for many different disorders. Acupuncture points are located on specific channels (meridians) that connect the exterior of the body with the internal organs. When the body is in a state of good health, Qi (pronounced chee) and blood flow smoothly through these pathways but when there is dis-ease or trauma there can be insufficiency or obstructions to the flow of qi and blood, which then cause an imbalance in the body leading to illness or pain. There are several different components to TCM (Traditional Chinese Medicine) such as Cupping, Gua Sha, Herbal medicine, Qi Gong or Tai Chi, lifestyle factors and Chinese Nutritional Therapy so there are alternative treatments to acupuncture if you are scared of needles.